Graco SnugRide Click Connect 35 Car Seat is a high-end, state of the art infant car seat that is built of an advanced material that is known as EPS foam. In a nutshell, the EPS foam is basically an energy absorbing material that is designed to shield the baby’s body and head in case of impact, and to protect rear-facing babies that weigh between four and as much as 35 pounds, and who measure up to 32 inches in height. This car seat is perfect for keeping your little travel companion safe, secure and most importantly, comfortable during the ride. With cushioned baby head support, a front adjusting five-point harness system and the advanced Click Connect technology, the Graco SnugRide Click Connect 35 infant Car Seat is the best way to keep your child safe while you are on the go. Besides this, the infant car seat also features the LATCH system, an advanced protection system that is now embedded in most high-quality baby seats available on the market. This one in particular is manufactured with Safe Seat Engineering, which means that it exceeds the US safety standards and it has managed to pass all the peak crash force and side impact tests. In other words, this infant car seat is perfectly safe and secure, and it is rated as one of parents’ favorite baby seats! Here you will find some of the main benefits and downsides associated with this product. As mentioned above, this infant car seat has been subjected to a series of rough tests, designed to measure the overall safety of the seat, and it was shown that the Graco SnugRide Click Connect 35 Car Seat actually has a great and highly efficient impact energy management capability. Moreover, this infant car seat is very versatile and easy to adjust, while the Click Connect capacity embedded in it allows parents to easily and seamlessly integrate the car seat with many Graco Click Connect strollers, which means that parents now have the opportunity to quickly create their own, personalized travel system for their babies. The infant car seat is also very lightweight and easy to manage, and it is specifically designed with the baby’s comfort in mind. That being said, the car seat is very generously spaced, and the infant head support that comes with it can be easily removed whenever needed (usually, when the baby outgrows it), so that the little one gets even more space in the seat. The LATCH system described earlier comes with an on-level indicator that allows you to easily install it, and the seat cushion is machine washable. 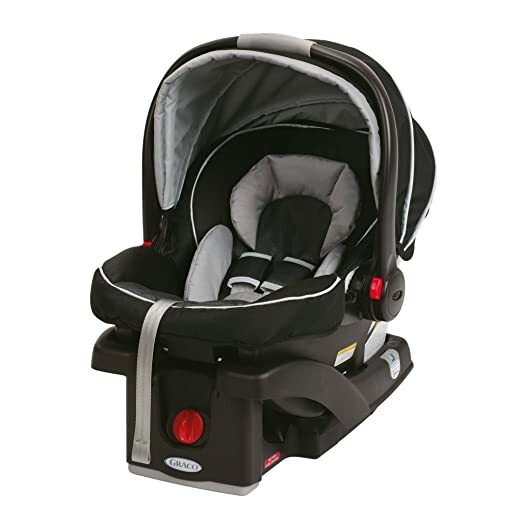 Last, but not least, the stay in car base of this infant seat comes with a six position dial adjustment designed to make installation easy and effortless, while the three-panel rotating canopy shields the baby from the bright light on a constant basis. Some parents have complained that the baby car seat is actually very difficult for single parents to carry, and that it does not fit any of the high chairs they can find in restaurants or even the plane seats. The bottom line is that this is a secure and affordable infant car seat that is far superior to many other similar products on the market – the benefits of the product definitely outweigh its downsides.